Safety, comfort and peace of mind comes with the Designer Hand Grip Grab Bar and is engineered into every Moen Home Care product we install. You can be sure that when you select Moen, you are getting a product that not only meets the ADA's standards, but yours as well. 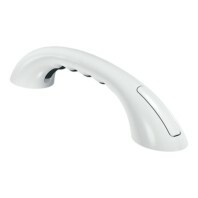 This Designer Hand Grip grab bar is great for inside or outside the shower and in or around the house. Need a little help steeping down that step in the living room the Designer Hand Grip looks great on the wall closest to the stair that you might need some help at. The Home Care by Designer Hand Grip Grab Bar is designed to help you keep your balance when you use the shower or the tub. Made from heavy duty plastic , this bathroom grab bar gives you a firm grip to easily hold.